This E-Learning system development that will serve as an attractive medium for students to search and book teachers based on the subject the teacher may have a qualification in. 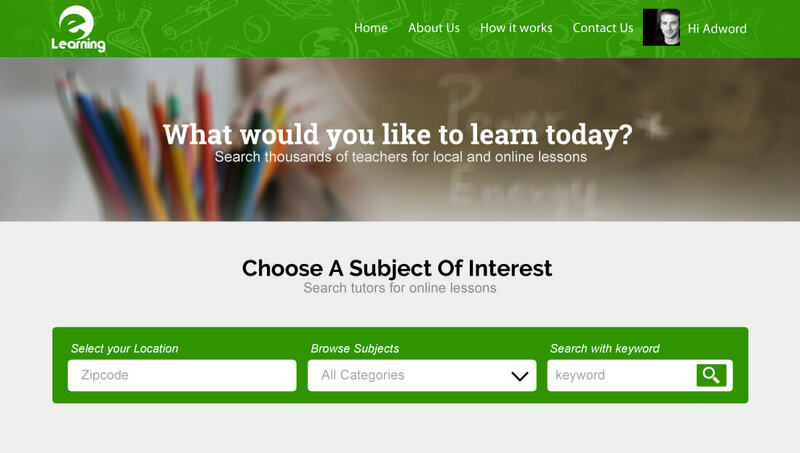 They can search for teachers on the basis of location they are based, Subjects that the student wants to learn and by entering some keywords if any related to search. On demand elearning system development allow students to view the details of the teachers which would include their rating, fees, qualification and educational details. Students can then check the availability of the teacher and book their class if they are available. Elearning system custom development allow teachers to create their profile on the website to make themselves available for students. They can manage their availability on their calendar which would be reflected on Student's side. 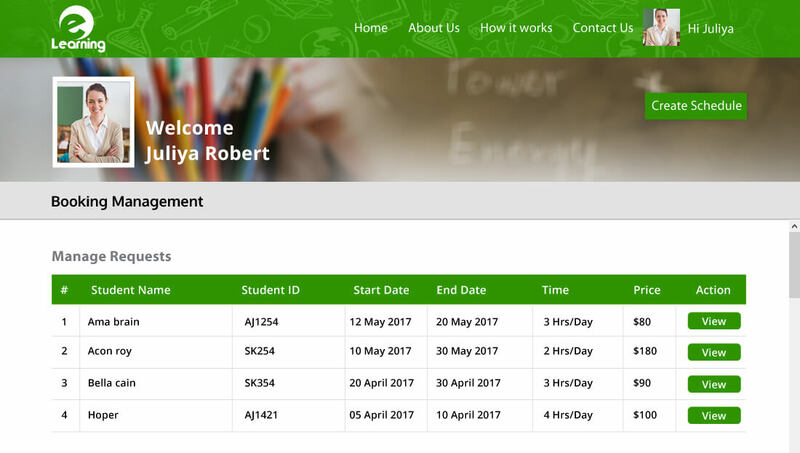 Teachers can manage the bookings received by them from students and view their details. Also, teachers can receive messages from students if they have any query. Student can search for the tutor by following criterias : Keyword, Category and Location(Zip code). Students can make payment for booked lessons. Secure credit card processing. 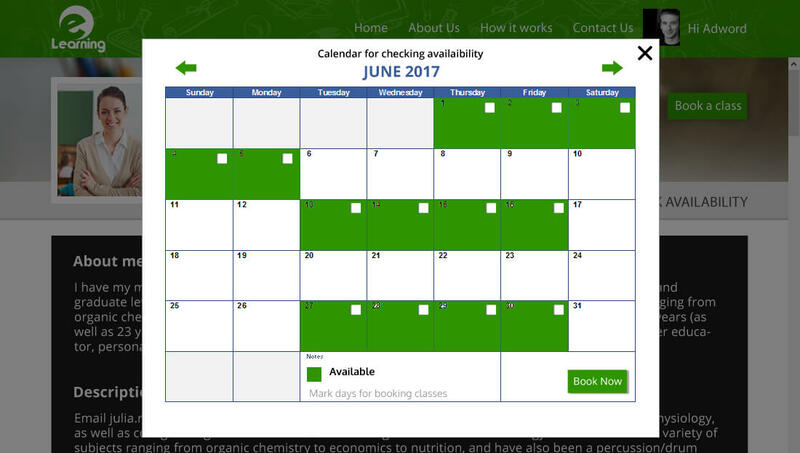 Students can check for availability of classes by looking at the availability calendar and book a time slot. Tutors can manage the bookings from the list of the booking they have received. Students can send messages to tutor and similarly, tutors can send messages to students. Students can view a list of classes/tutors according to their search criteria. Tutors can create the schedules by selecting the date and time, then they will mark it as available or unavailable. 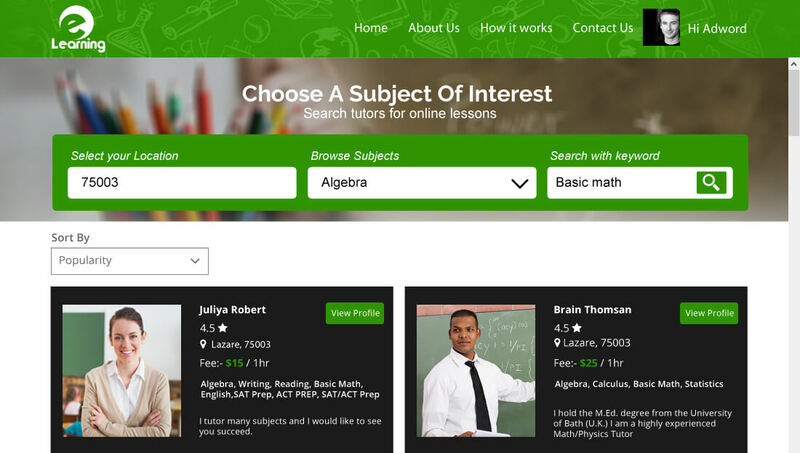 Students can view profile details of tutors and lessons offered by them. They can view every detail. 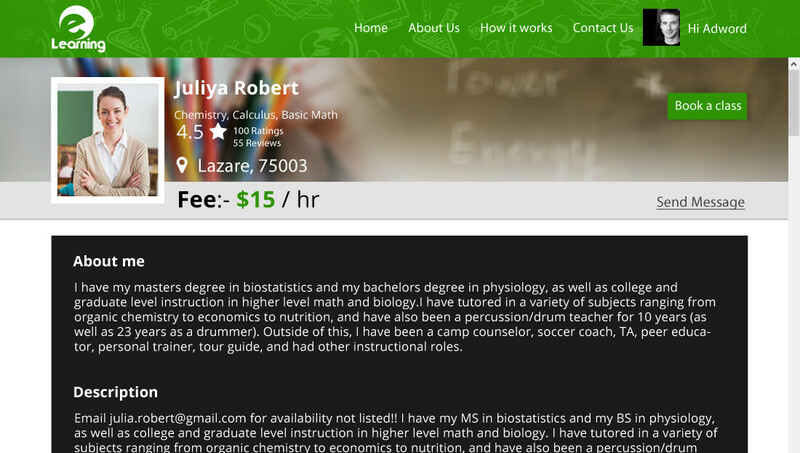 How can students search for teachers that they want to book class with? Students can search for the Teachers by following criterias : Keyword, Category(will have an option to search classes through selecting subjects defined by the admin over the website) and Location(Zip code). Time taken to implement your E-Learning System depends on the level of customization and data migration. The time frame generally ranges 5-6 weeks. How can a student contact a teacher? Students can send messages to the teacher if they have any problems regarding the information provided by them. Can a student rate a teacher even if they havent taken a class from them? Yes. Students once logged in can give a rating to the teachers on the website. Does teacher need to add courses to the website? The teacher need not add courses to the website. They can just enter the subjects they teach and experience they have in teaching them. How can teachers manage the booking they have received? Teachers will be able to see the list of the booking they have received. Teachers will be able to select the respective booking and then can see the respective details.